At the conclusion of the Third Triennial International Movement Esasperatismo Logos & Bin, which was held in the beautiful and prestigious setting of Castel dell ‘Ovo, Naples, from February 5 to March 3, 2011, with great success, visitors flocked from all over Italy and abroad, interested in our cultural message, I would like to thank the 110 artists of the movement with which their works on display have been able to express and disseminate the message of Esasperatismo. I thank the three bins of Gold “to present at the Culture, Advocate Gerardo Marotta, the Maestro Roberto De Simone and Professor Clementina Gily, recipients of the Award for the years 2008, 2009, 2010, with their efforts to the highest thickness, were able to give prestige to an artistic event and a cultural reality in which not have of media all attention they deserve. 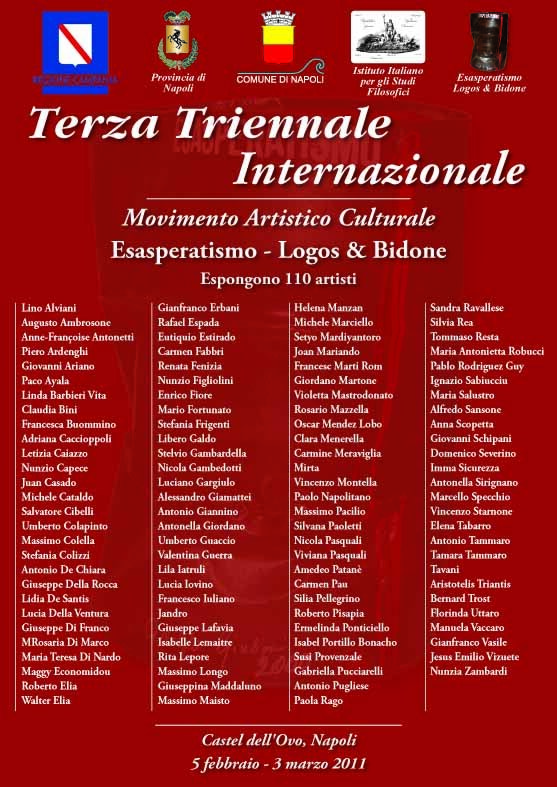 Previously, on 11 December 2010, at the Palazzo delle Arti Napoli (PAN), was presented the same catalog of the Triennale and celebrated with a special status of Italian Post Office with a mobile office, the tenth anniversary of the Movement Esasperatismo Logos & bin which was created a special card. The occasion was delivered on 3 ° “Golden Bin” for the Culture 2010 to Clementina Gily Professor, Professor of Aesthetics at the University Federico II of Naples. At the conference moderated by the intervened lawyer the Professor Clara Guarino, Gerardo Marotta, founder and president of the Italian Institute for Philosophical Studies, Maestro Roberto De Simone, a theater director, composer and musicologist, Professor Emily Mallard, head teacher, Dr Nicola Oddati, Minister of Culture of the City of Naples; the Professor Dominic Raio, journalist and writer. The award “Golden Bin” for Culture was established in 2008. The first three were awarded annually. The next will be awarded every three years, from 2013, coinciding with the International Art Triennale.